We’ve only just begun to catch up on rest from our shoot in El Paso, TX and Las Cruces and we’re already planning the next month of travel! In a few weeks we are going on a speaking tour of sorts, presenting about bike tourism at various conferences. We’ll be in Iowa, Ontario and San Diego spreading what we’ve learned about bicycles as economic development. Bicycle tourism manifests itself in many forms and one of the most visible ways is the multi day supported bike tour. Perhaps the mother of all event rides is RAGBRAI which is the country’s largest multi day event ride. Bicycling tourism is a big deal in Iowa and generates $365 million dollars a year in economic impact anually. A few years ago we had the opportunity to film Cycle Oregon, a RAGBRAI inspired tour in Oregon. Cycle Oregon from its very beginning was conceived as a way to bring people from urban areas to ride in the rural areas that were getting hit hard by the decline of the timber industry. 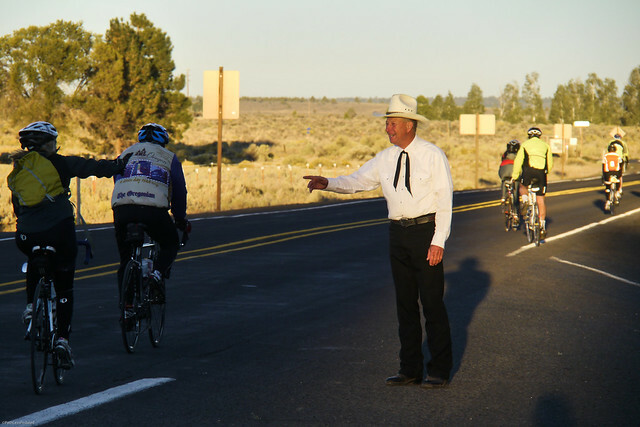 The first Cycle Oregon is riddled with stories of riders going hungry from not enough food and small towns overwhelmed and surprised by a thousand lycra clad visitors. 25 years later, Cycle Oregon has matured into a well oiled machine both logistically and philanthropically. Not only does Cycle Oregon create a huge economic impact during the event, but it also offers grants to host communities. Perhaps more interestingly, many riders that have a good experience in a town during Cycle Oregon will often return to visit again. We made a half hour documentary on Cycle Oregon’s 25th anniversary ride a few years ago. Here is an edit that gets to the spirit of the ride and the possibilities of bikes as economic development. Love it!! Montana should do this! !